Lucia Davis ’04 has lived a lot of lives. She spent a summer singing opera in Rome. She was an assoc-iate editor for iMedia Connection, which covers the digital marketing world. She’s written for Atlas Obscura and other publications, including Alumni Horae. She led content development at Obviously, a social media agency in New York City (founded by formmate Mae Karwowski ’04) that helps companies navigate the waters of Facebook, Twitter, Instagram, and other platforms. The steep learning curve didn’t faze her, though. Her vision was too important to let something like not knowing how to apply for grant money (or not being an artist) get in the way. Davis has been a quick study, however, as she recently earned a $5,000 grant from Josh Groban’s Find Your Light Foundation, a nonprofit champion of the arts and arts education. With ingenuity, vision, and creativity, Davis has created a touring art show – in a school bus. She is seen here in the newly purchased bus. The idea for The Art Bus Project (ABP), Davis says, had been rattling around in her head for a while. In a talk delivered in May at the end of a two-month Guild Hall residency in East Hampton, N.Y., for her work in the field of curatorial/critical studies, Davis admitted that she rarely answers the question about where the idea came from the same way. 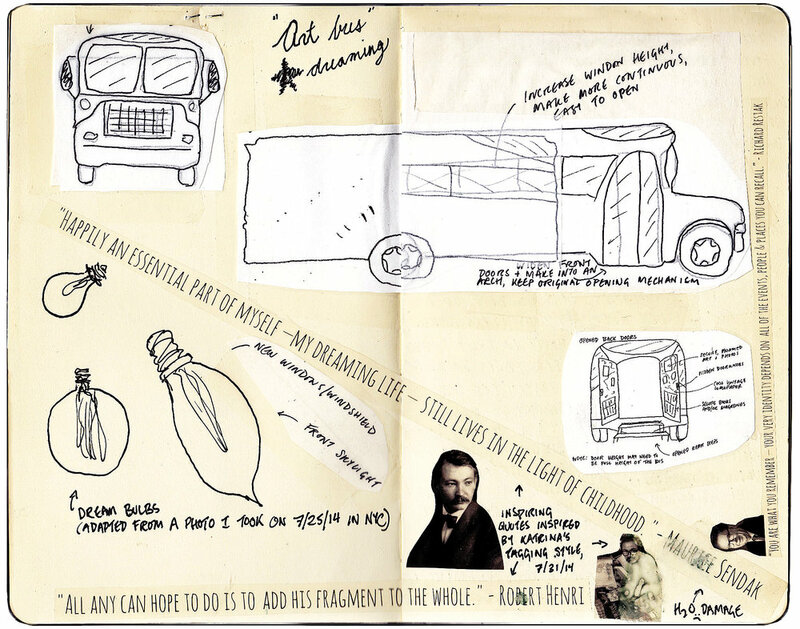 An idea is born: Seminal entries from Davis’s journals reveal her thinking process as The Art Bus Project began to take shape in her mind. Davis has been developing her own voice since graduating from St. Paul’s. She went to Scripps College, graduated with a degree in economics, and began writing for EQUITIES Magazine. She next worked for a pair of publications about the communications industry, before taking the position at the fledgling Obviously, which inspired her ABP initiative. The bottom line is, Davis believes art can heal and is a strong advocate that art needs to go where people are – instead of people coming to it, a la visiting amuseum. As far back as 2011, she cites her own experience with art as a transformational force, recalling a Guerrilla puppet show – a form of public theatre with a social conscience – she saw on a street corner in Los Angeles. While in London in 2014, she became “obsessed” with the idea of an art collective, but didn’t have a title for it. “The Art Bus Project” was meant to be a temporary name, but it stuck as she formed a 501(c)(3) nonprofit in that name. Throughout 2015, Davis set out on a road trip through 21 states, visiting artists, learning more about the creative process, and earning an informal education on what it takes to make art happen. Among the artists she met were inmates exhibiting their work at the hobby craft sale at the Angola Prison Rodeo (Louisiana State Penitentiary) in Baton Rouge, La. The ABP began to take shape, almost creating a life of its own, as Davis talked to more and more artists and her vision became more viable as a result. For the ABP to become a reality, Davis first needed to secure an actual bus to create her portable gallery. She began fundraising in earnest in the summer of 2016, using the crowdfunding site Classy.org to get the word out. She put her social media experience at Obviously to work, launching a clever campaign that used Facebook and other sites to promote the crowdfunding effort. The goal was to raise money for purchase of a retired yellow school bus. Together with her executive director and “right-hand woman” Hannah Fox, Davis was determined to raise $19,000 to purchase a bus and $11,000 more to renovate it into equally functional exhibition hall and classroom spaces. There were touch screens and listening booths to install, a compulsory vehicle tune-up, and a generator required to power it all. To advise her in the endeavor, Davis created an all-woman board, a deliberate choice, she said, in a world still dominated by men. The successful campaign featured back-to-school challenges and giveaways as incentives to join the effort. In the end, Davis and Fox raised just under $18,000 in Phase I, before they purchased a yellow school bus from the place where all yellow school buses go after retirement – eBay. media experiences. Romy Aura Maloon of Atlanta has South African roots, a first-generation American story, and expresses those dual identities in her work. Maroon’s site-specific installations snake up the walls of buildings. Philadelphian Tim McFarlane’s colorful, multi-layered paintings have been displayed in exhibits in New York, Miami, and Dallas, among other locations. David Rothenberg is a jazz clarinetist and composer, with nine CDs to his credit, along with a book called Why Birds Sing, an exploration of making music with birds, which later became a BBC documentary. Jason Arthur Sapan works with holographs and laser light to create portraits and abstract forms, while Anna Wittenberg’s installations and performances explore how play has cultural and biological significance. In an ambitious tour slated for the spring of 2018, the bus will travel to the hometowns of each of the eight artists, from New York’s Hudson Valley to Miami, Fla. Each stop will incorporate the opportunity for the public to come on board the bus to view the art, be part of events that feature the artists themselves, create their own art, and otherwise be inspired. The first photo documentation of The Art Bus Project. Founder Davis and featured artist Mark Cline mugging for the camera in his Natural Bridge, Va., studio, in December 2014. All work and no play: Co-founders Davis (l.) and Fox on the bus. To learn more about Lucia Davis '04 and The Art Bus Project, visit www.theartbusproject.com.